For a guy who grew up in a completely ethnic neighborhood in the East Bronx, I have no idea where or when I became smitten with this dish popular throughout Latin America. A reasonable assumption could be that hash has always been high on my list. So last evening, dinner, with an urge for Cuban food, based on the spotlight the Popes’ visit has caused I opted for Picadillo with authentic Cuban ingredients. What was missing that would have made it truly authentic was Green Olives, I substituted Black. Other than that, the toughest Cuban food critic wuld have approved. 1. In a large saute pan, heat 1 TB of EVOO over medium-high heat. Add the ground Beef, & brown the meat, stirring occasionally. Remove the browned meat & drain the excess fat from the pan. 2. Add the remaining 1 TB of EVOO, & heat over medium heat. Add the Green & Red Peppers, Onion, Garlic, & Bay Leaf. Sauté until the Onions are translucent. 3. Return the meat to the pot, & add the remaining seasoning ingredients. Bring the mixture to a boil. Reduce the heat to low, cover, & simmer for 15 minutes, stirring frequently. 4. 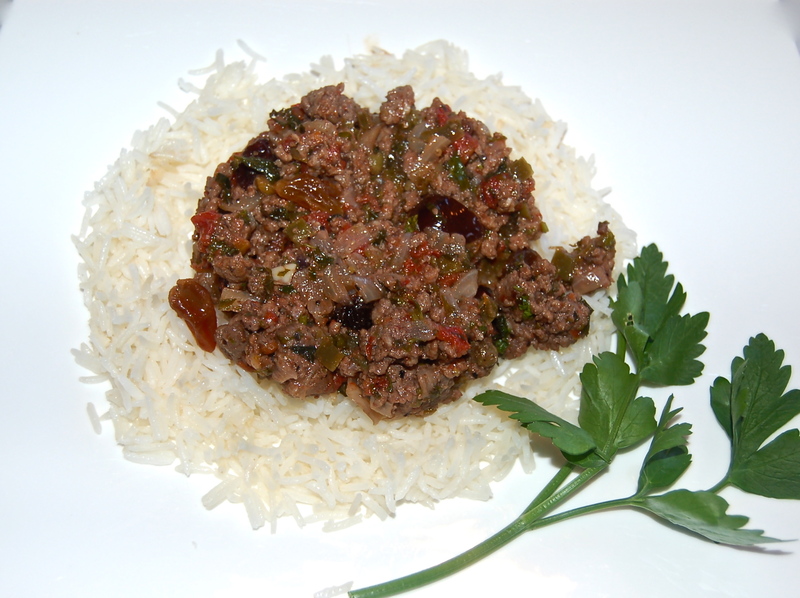 Remove the Bay Leaf & serve the Picadillo over White Rice.